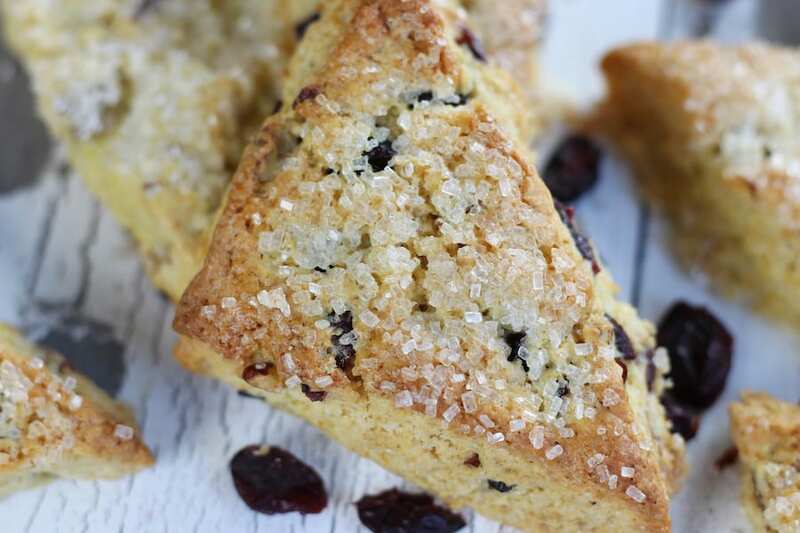 Orange Cranberry Scones is an easy recipe that produces a buttery and light textured American style scone. Its sweet and bright orange flavor makes it perfect for Holiday celebrations or a delicious treat with a cup of coffee. My husband and I recently enjoyed scones with our morning coffee on a short vacation to one of my favorite places. I not sure if it was because we were relaxed in a gorgeous location or because the scones were just so tasty, but we both ate the last bite of that buttery scone and we wanted another. Since we were already on the road, we didn’t go back to buy more. Eating that scone reminded me that I had a phenomenal recipe at home that I had inherited from a former employer years ago. The original recipe was a basic American scone but used self rising flour, a flour that I would prefer not to use. Pro Tip-Using all-purpose flour and adding in my own baking powder and salt allows me to use quality ingredients, such as a baking powder that is aluminum free and sea salt. 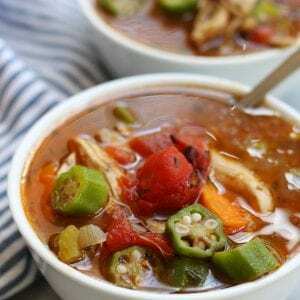 What I loved about the original recipe was it was soft, tender and very buttery. 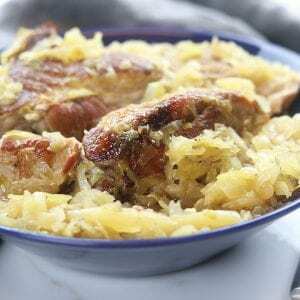 I kept what made the recipe so amazing, but adjusted away from using the self rising flour. I also added one of my favorite Christmas flavors, orange cranberry. If you love orange cranberry also, then you will definitely want to check out my Orange Cranberry Walnut Balls, Simple Orange Cranberry Pistachio Fudge and my favorite Fresh Orange Cranberry Sauce. Cold butter! Probably the most important tip. Cutting the butter, when it’s straight from the refrigerator, into small cubes and then placing in the freezer for a few minutes is one of the best ways to ensure that the butter is cold when it is mixed into the dry ingredients. Don’t over process. Over processing the butter with the dry ingredients can cause a tough scone. The best way to prevent this is to mix the flour, salt, baking powder and sugars extremely well before adding the butter. Also, butter cut into small cubes will help it to incorporate the mixture faster. Have the correct tools. Honestly, you can still pull off an awesome scone using bare minimal tools but the job becomes 1,000% easier with the correct tools like this for easy cutting of the scones. Also, if you don’t already have a quality food processor, a pastry blender is an affordable tool for mixing. Add a little sparkle. This is an optional step but it makes the presentation so pretty and fun. This is the brand that I know and trust. How do you make the perfect scone? The answer to this question depends on who you ask. American scones tend to be much more buttery and have a lighter texture than a British scone does. We Americans also enjoy flavoring our scones and making them more on the sweeter side. The British, on the other hand, enjoy adding more butter and jam to their hot scones. For wonderfully perfect American scone I suggest following the tips above and follow this recipe for a perfect British scone. Since an American scone is basically a sweet biscuit, most recipes do not call for egg. 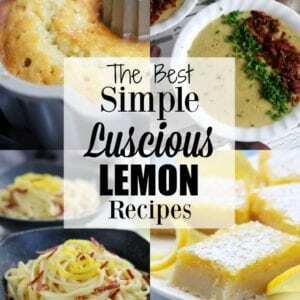 However, there are some recipes that do and the some bakers believe it enhances the taste. 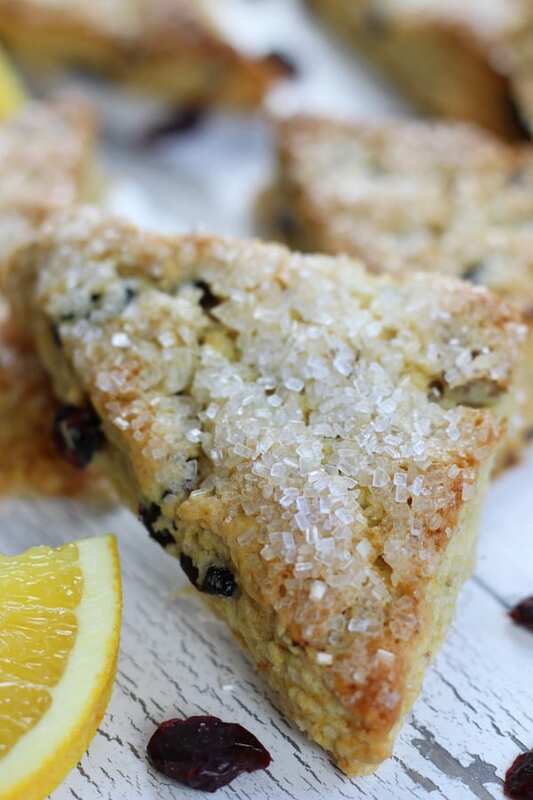 For these Orange Cranberry Scones no egg is necessary because they taste amazing and have a wonderful texture on their own. 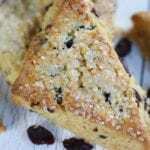 What is the best raising agent for Cranberry Orange Scones? It is my personal opinion that good old fashioned baking powder is by far the best raising agent for scones. Why do you glaze scones with milk? 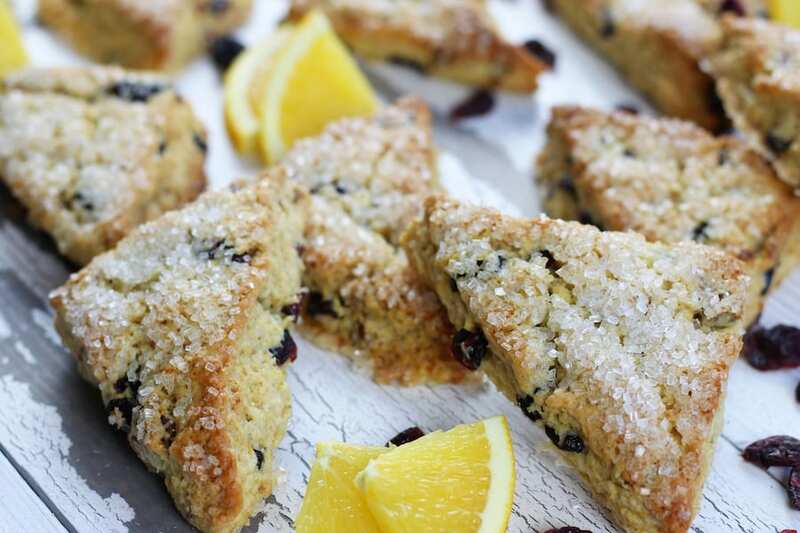 There are two main reasons to glaze these cranberry orange scones with milk. It encourages browning on the top of the scones. Without the milk it is challenging to achieve that gorgeous golden brown without over baking. It helps the decorative sugar to adhere to the top of the scones. When making these scones for company or the holidays the decorative sugar adds a pleasing sparkle. 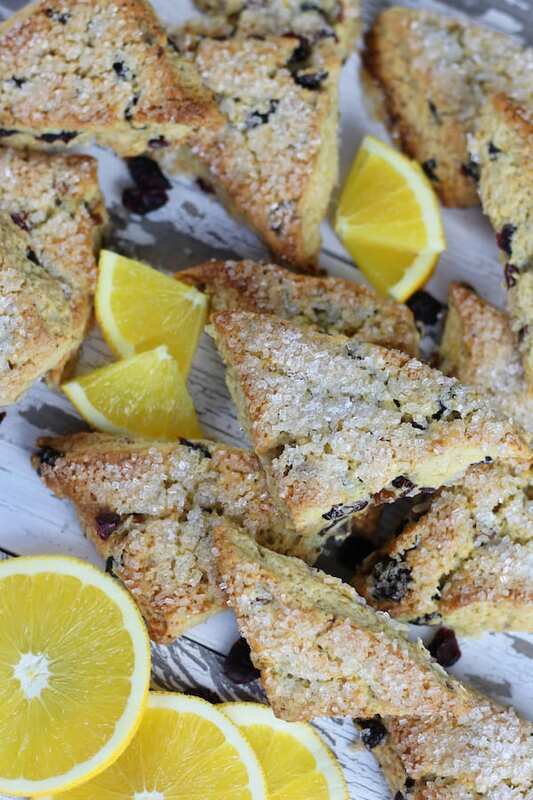 A family favorite, Orange Cranberry Scones recipe produces a light textured American style scone that has a sweet and bright orange flavor. Perfect for Holiday celebrations or a delicious treat with a cup of coffee. Cut cold butter into small cubes and place in freezer while preparing dry ingredients. Place flour, salt, baking powder and sugars in a food processor and mix until well combined. 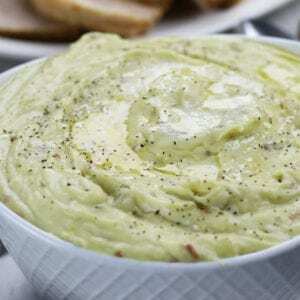 Add in cold butter cubes and pulse until mixture resembles pea sized crumbles. 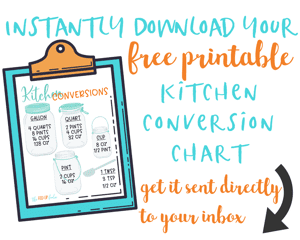 Transfer to a medium sized mixing bowl. Measure cream and stir in orange zest and extract. Stir well. Make a well in crumble mixture and pour cream into well. Using hands mix until a ball forms. May need 1-4 additional tbsps of cream if dough is too dry. Fold in pecans and cranberries by hand. Place dough onto lightly floured surface. Roll into a large square that is 1 inch thickness. Cut dough into 2 inch squares and then squares in half to form a triangle shapes. Place on ungreased cookie sheet. Brush scones tops with milk and sprinkle on decorative sugar. Bake for 12-17 mins or until scones reach a light golden brown.